Convenience pack provides easy access. Ergonomically designed--half the weight; half the lifting. Jam free performance. Reclosable box keeps paper fresh and dust-free. Meets Executive Order 13423. 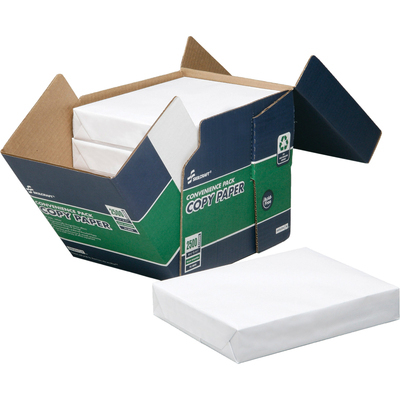 Convenience pack paper comes in a reclosable box which is uniquely designed for multi-purpose copy paper. Perfect for spaces ranging from small office cubicles to large copy centers, providing easy access and storage. The is ergonomically designed--half the weight; half the lifting. Paper provides jam-free performance and is acid-free for archival quality. The virgin pulp used is elemental chlorine free (ECF). The packaging contains at least 40% recycled content, no staples, tape or glue. Reclosable box keeps paper fresh and dust-free.